Using gas stove as your method of cooking? Well, the same with me, I also use gas stove most of the time. It is indeed a good choice for those who definitely love traditional cooking. However, do you want to improve its performance? If yes, then picking the best pots and pans for gas stove should be considered. Good to know that there are wide options to choose from in the market today. So with that, we have researched for the best options and come up with a buying guide along with reviews to help you make the right decision. Why did majority opt to cook using a gas stove? I would say that it could be due to numbers of benefits that cooking with natural gas providers. In fact, one of the major benefits it offers is that it is very easy to control. You’re provided with fine control in terms of heat level as you heat the pots or pans. And there is the fact that gas is an instant heat that gives a precise control once cooking. Gas is a direct heat wherein there is very little to heat up than the pot or pan. Since there is already a use of electronic ignition, you will not check if the pilot light has caught or you wouldn’t need to fiddle around with matches and eventually burn your fingers just to light a flame. You don’t want that, right? With the use of a gas stove, you can continue cooking and feed your family though there is no power. Ease of use and convenience are both provided by gas a stove. And numerous benefits could still be experienced if you will choose to cook using a gas stove. But, along with that, there is also a need for you to choose the ﻿﻿best pots and pans for the gas stove. Use only the best cookware that matches your gas stove. You really want to experience the above-mentioned benefits, right? So, you are now planning to use gas stove a lot often once cooking. And as said earlier, you also need the right cookware that suits well on the gas stove. Since gas stoves have a burner that emits a ring of flames, it is possible for the stove to provide a broad range of temperature settings. Though it is possible that you might use any kind of cookware on gas stoves, choosing only the best and most suitable pots and pans will provide the desired results. Cast Iron. Known as an affordable cookware, this material is suitable for slow but even heating once used on the gas stove. It is also durable and it works best once heated over a low flame. However, prior to using this cast iron pots or pans, you might add a layer of oil to create a natural non-stick coating. And also, a good way to help prevent sticking is to use enamel cast iron containing a layer of enamel. Copper. Considered as a soft yet durable metal, copper is a great conductor of heat and so a certain factor which makes it work best on gas stoves. Copper pans or pots might be expensive but they could facilitate even distribution of heat. They are also responsive to small temperature changes. There is some copper cookware that is coated with stainless steel, nickel or thin. Anodized Aluminum. Aluminum offers even distribution of heat so cookware made of this material is indeed suitable for gas stoves. Aside from that, the said material is also lighter and affordable compared to other materials. For a non-reactive surface, aluminum might be coated with stainless steel. Gas stove offers a wide range of temperature settings. So with that, the best pots and pans for gas stove must be able to withstand the high temperatures emitted. And besides, they should also withstand the high temperatures having not to burn your food. Once working in a busy kitchen environment, always keep in mind that comfort is an important consideration. If you are preparing meals for a party or large family, you might want to have a pan which could move around having not to worry about hurting your wrists or hands. So, the best option should have a well-constructed and well-designed handles for ease of use and comfort. Along with that, the handles must be able to withstand high temperatures that could reach up to 600 degrees Fahrenheit. You must choose the right pots and pans that will make it possible for you to cook favorite meals without having to use a lot of oil. And also, non-stick surfaces are considered as scratch-resistant and could allow even heat distribution. The durability of cookware couldn’t be determined only by the material from which the pots and pans are constructed. But, the designs, exterior, and interior finishes also play crucial roles in influencing their durability. There is a need for the handles not to come loose and also the surfaces must remain clean and smooth. Once the cookware looks new though you have them for many years, you could place them on your kitchen counter without having any embarrassments. A chemical free cookware is considered as a great choice. The materials that are used in constructing the pans must not react with food. 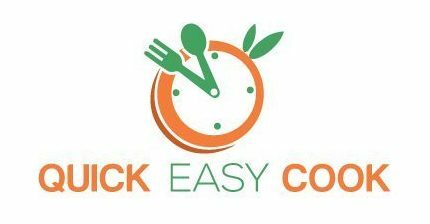 This will not just help you in terms of preparing healthy food for the family but would also go a long way in terms of creating a safe kitchen environment. When buying cookware, this is an important feature to look for. What if you’re in a hurry and you end up scraping an ordinary cooking pan? What do you think will happen? Well, there are high chances that this would lead to scratches. But if the cookware is scratch and stain resistant, scratches aren’t your worries at all. You will not worry about having to shop a new one even after heavy scraping or knocking off of the cookware too. Take note of these factors once you are looking for the best pots and pans for the gas stove. This cookware set deserves to be put on top of this list. It features quality products along with different uses that perfectly fit the needs of every individual that cooks on a gas stove. A cookware set with 17 pieces in all, T-fal E765SH could offer the best results once cooking on a gas stove. 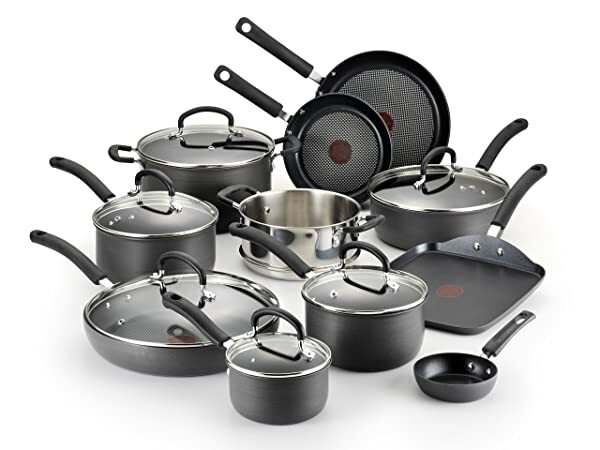 The set includes three fry pans ranging from 8, 10.25 and 11.5 inches, three saucepans with 1, 2 and 3 quarts capacity, 10.25 inches square griddle, 3.5 quarts capable deep sauté, insert steamer with 3 quarts capacity and a Dutch oven with 3 quarts capacity. All of them do have their lids as well. 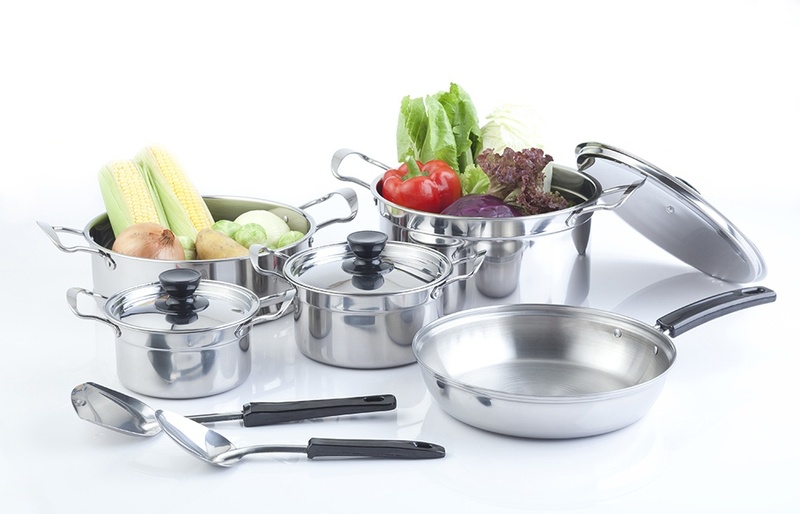 This cookware set is constructed from anodized aluminum making them a lot more durable than others. There is an egg wonder pan in the Dutch oven that is found in the pot having 5-quarts capacity. Along with that is a Thermo-spot indicator which ensures proper heating. 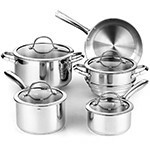 In addition, the interior of this set is hard titanium and also non-stick that would ensure a long lasting performance. It has silicone-riveted handles that are intended for safety and comfort. And the pots also have techno-resist anti-warp base ensuring that they are safe from an oven. On the other hand, there are some issues associated with the use of this product. It includes weight imbalance of some pans, development of rust spots as well as discoloration, and this cookware set is not suitable to be used on high heat. And for the best choice when it comes to addressing your budget, then this cookware set is a wise choice. I wouldn’t want to forget including a product that suits perfectly to those with a tight budget, so I included this one. With this cookware, you will definitely get a lot from your investment. The set is dishwasher safe and oven compatible as well. It includes sautéing pans, skillets, stockpots, and steamer insert that provides extra value. You will definitely not break your bank with this cookware set. 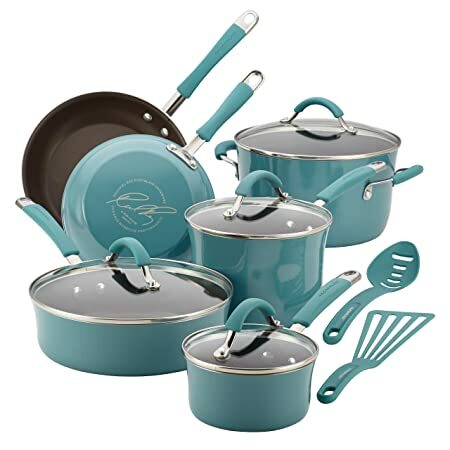 And the best thing that this set could offer is its sturdiness since this cookware set could be used repeatedly yet there will be no food sticking or discoloration. But of course, there is a need for you to know how to clean as well as care for stainless steel cookware or else you might experience some problems in keeping the set clean. 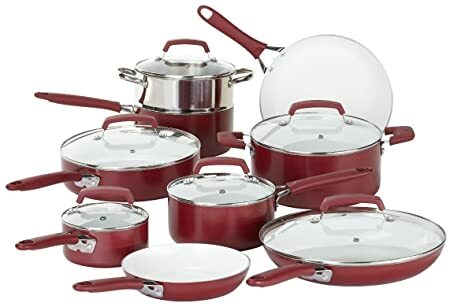 I included this cookware set in the list of your possible options because of the fact that it could indeed respond well to your cooking needs. Along with that, this set could be best once you want to decorate your kitchens because it comes in different colors. This set comes in agave blue color and it includes 12 pieces. Indeed, the color is modern and rustic. The design of this cookware set is to function and enhance the warmth and hospitality of the meal times. But what is included in this set? It includes 2 covered saucepans with one and three quarts, a 6 quarts stock pot, 8 and 10 inches skillets, and 3 quarts sauté pan. All of the have dual-riveted stainless steel handles which are rubberized. They also have lids that are shatter-resistant. And the design is aluminum and enamel porcelain exteriors making them a lot more durable. Known to be free from PFOA and non-stick, it easily releases food. But, you might find the stock pot to be a bit small and the Teflon coating might not be strong enough as well. If you also consider induction cooktops, this set might not be the best choice. 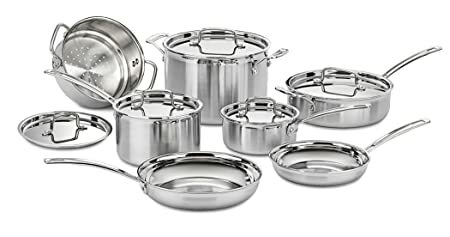 Another great cookware set that deserves to be included in the list is the Cooks Standard 02492 9-Piece Classic Stainless-Steel Cookware Set. If you are looking for an ergonomic cookware set, this product is a great choice. With nine pieces in a set, this cookware set all has an aluminum at the bottom. You are guaranteed with even heat distribution. Along with that, this set offers a patented design which has an air flow keeping the handle cooler and comfortable to hold. Indeed, this one is suitable for almost all cooktops. So, what’s included in the set? Well, it has 1.5 quarts covered sauce pan, 10 inches open skillet, and 3 quarts covered sauce pan, universal steamer, 6 quarts stock pot and 1 ½ quarts small covered saucepan. Plus, this cookware could be used in an oven with a maximum of 500 degrees together with a safe glass lid. But, certain cases like getting some scratches might be experienced once this cookware isn’t carefully handled. This product is also included in the list because of the fact that it will surely fulfill most of the cooking needs by an average individual. In fact, to make this set better, a steamer insert is included. WearEver C943SF is a very sturdy base along with an aluminum base which could spread heat evenly and quickly, therefore, this will make the temperature control a lot easier. With its ceramic coat that is non-reactive, it means the food wouldn’t have any discoloration or some other unexpected results. In addition, it is a cookware set that is non-stick making your food slides right off and ensuring a perfect look. Good to know that they also clean very easily. Plus, this cookware is safe both in oven and dishwasher. However, certain flaws are also observed with the use of this set. Scratches might be experienced and if you are looking for additional accessories, it has none at all. There you have it! You are provided with the best options when it comes to pots and pans for gas stoves? But, which one stands out from the rest. For me, I would pick T-fal E765SH Ultimate Hard Anodized Non-stick Cookware Set. Why? It is a quality cookware set that is also beautiful to display in the kitchen. This cookware set also has all the basics that I need. Pots and pans could be cleaned and maintained easily. And this best pots and pans for gas stove could also be comfortably used in an oven. Indeed, the right cookware will offer better results once used on a gas stove. Buy the right one now! Did you find the article helpful? If yes, we are happy to hear your thoughts! Just please leave your comments below! 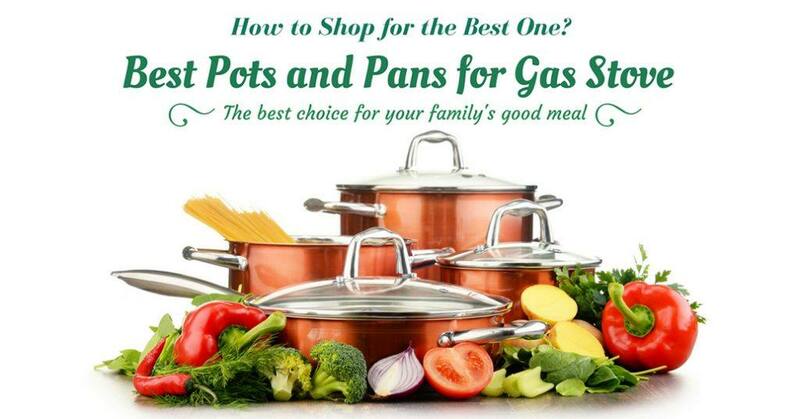 Best Pots and Pans for Gas Stove: How to Shop for the Best One?